Built at Blythe Shipyard in 1941 for the Royal Navy as a Boom Defence Vessel. 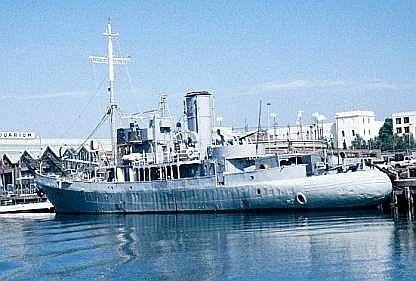 Sailed to South Africa in 1942 and renamed HMSAS Barcross. De-commissioned in 1947 and re-commissioned in 1955. Renamed SAS SOMERSET as part of the South African Navy. De-commissioned again in 1986 and moved to Table Bay in 1988.